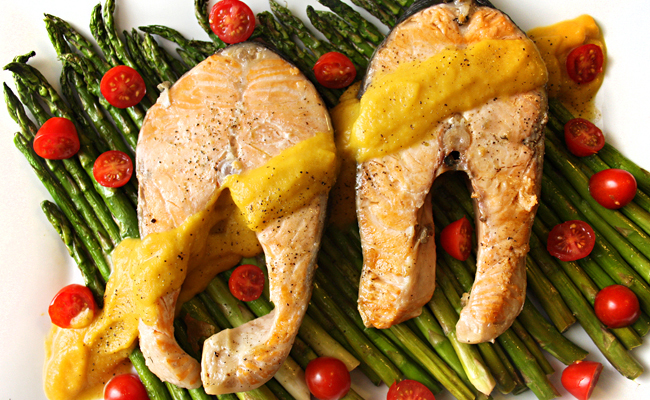 Grilled Salmon with Grilled Asparagus & Curried Butternut Squash Sauce Recipe | Exploring Food & Drink in D.C.
Cut the bottom ends off and coat asparagus in olive oil. Season with salt and pepper. Coat salmon with olive oil or melted butter. Season with salt and pepper. Grill salmon on aluminum foil over medium heat 3-5 minutes on each side or until cooked through. Plate, and serve with Curried Butternut Squash Sauce. Preheat oven to 425F Degrees. Line a baking sheet with aluminum foil. Cut squash in half. Clean out the seeds. Brush on 1 TBSP of butter. Salt & Pepper generously. On a rack in the center of the oven, roast squash for 50-60 minutes. When squash is done you should be able to insert a fork easily into the flesh. Set pan with squash aside on a cooling rack until cooled enough to spoon flesh out and discard the skins. In a large sauce pot saute onion and pear in remaining 1 TBSP of butter until soft. This takes approximately 6-8 minutes. Add water, chicken broth, and squash to the onion and pear. Bring to a boil, then reduce heat and simmer for 20 minutes while breaking up any large pieces of squash. Remove from heat & add heavy cream. Using a food processor or immersion blender, blend the soup mixture until smooth and creamy. Tags: asparagus, butternut squash, recipe, salmon, seafood. Bookmark the permalink. That looks so fresh and delicious. I love salmon and I’m eating it right now as a matter of fact.